Note: "UPE" stands for Universal Primary Education, indicating normal (free) government primary schools. This post is a second annual roundup of policy and research in the “Global Education Reform Movement”. GERM was coined as a pejorative metaphor for the spreading of “neoliberal” market-orientated education reforms. But it's actually quite a useful label for the set of ideas being experimented with around using assessment, accountability, and greater autonomy for schools to improve education. The Kaduna State Government announced plans to fire 20,000 teachers for failing a grade 4 student exam. The Economist reported on the most frenetic education reforms in the world, in Pakistan. The Government of Uganda announced the phase-out of its private secondary school subsidy scheme, despite evidence showing its cost effectiveness. The Global Education Reform Movement high society wedding of the year: Ekta Sodha (CEO of Camus-Sodha Schools) and James Tooley (the “Indiana Jones of education”) got married. President Museveni recommended that parents send their kids to private schools instead of government schools if they can afford it. An important paper was published in the American Economic Review showing that school integration in Delhi led to reduced prejudice from rich kids about poorer kids. From Washington DC, more evidence that vouchers don’t help low income students. The Gates Foundation launched its new Global Education Strategy, for now focused on generating better data and further research to better understand the problem. The FT and technosociologist Zeynep Tufekci discussed how Silicon Valley tech giants tend to dislike the use of technology in the schools that their own kids attend. John Rendel, founder of the British/Ugandan/Zambian non-profit private school network “Peas” stepped down after ten years of running the group. The (now abandoned) A-F grading of NYC schools appears to have had positive impacts on the lowest performing: lower teacher turnover and quicker school improvement than the schools ranked just above them. This study in Ghana found that parent engagement in pre-school made results worse. Results published from an ASER pilot in Bangladesh compared BRAC schools with government schools. BRAC are the largest non-state school operator in the world, with nearly 50,000 schools. The results, from a small sample, did not show any substantially better performance in the BRAC schools. The new Liberian government announced that the Partnership Schools programme would continue. A second round of RCT results are expected in 2019. Swaziland became the 15th country to launch a citizen-led student assessment (following in the footsteps of ASER and Uwezo). The Centre for Education Economics in London published their first annual research digest focused on studies from developing countries. “Teaching at the Right Level” - an innovative classroom management approach pioneered by Indian NGO Pratham with JPAL and now being replicated in several African countries took steps towards institutionalisation, launching a website and holding a conference. The World Bank released the new Human Capital Index - designed to rank countries and encourage them to get as competitive as they are about the Doing Business Index. UNESCO was not happy, saying “different calculations do not help”. A harrowing ProPublica investigation was published on multiple rapes of young girls by a Liberian staff member at the More Than Me academy in Monrovia in 2014. Just 11 years after the start of the project and 5 years from first submission to a journal, the landmark “scaling up from NGO pilot to government implementation is harder than you think” paper by Bold, Kimenyi, Mwabu, Ng'ang'a, Sandefur is finally published in the Journal of Public Economics. A new report by Alina Lipcan and myself provided the first independent measurement of learning in Bridge International Academies private schools, from Lagos (mentioned in the new BBC podcast “People Fixing the World”). The Varkey Foundation Global Teacher Status Index again highlighted the importance of the esteem in which teachers are held in a country for the outcomes. 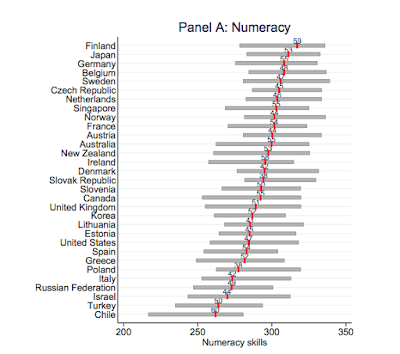 Across countries teacher status is not though that closely correlated with pay. After much anticipation, results were finally released from “PISA for Development” - a new approach to including lower-income countries on the PISA scale. The EU parliament passed a resolution calling for donors to stop funding commercially minded private schools. Left-winger Obrador was elected in Mexico promising to reverse reforms designed to increase accountability for teachers. Overall I come away from the year a little less enthusiastic about vouchers in particular, but with continued hope for intelligent reforms based on the broad principles of accountability. In particular, a critical point made most recently by Karthik Muralidharan in his contribution to the New Economic Strategy for India, is that too many education systems are really orientated around sorting and selection of the best students, rather than actually building human capital for all. The first step in a system of accountability for schools is letting them know what their priority objective should be, and for most schools in most developing countries, I'm not sure it is actually clear to them that their goal should actually even be universal basic skills. And of course even if it were, there then needs to be the right structure of support and monitoring to ensure that this goal is actually being worked towards. This movement has achieved a lot of change, but there is still a long long way to go, with a lot more experimentation needed and a lot more to be learnt about what the best policies are (and perhaps of equal importance, how to build the state capability necessary to actually implement policies). Thanks to Susannah Hares for several suggested entries for this piece. This summer I finally got around to doing my first Park Run, joining the now millions of people around the world who turn up on Saturday mornings for a free 5km timed run around their local park (I managed a not too shabby 27 minute time, roughly average for my age). I also work on global development, so was pretty disappointed to receive an email announcing a new clothing line from the founder of Park Run that will be manufactured exclusively in Europe. Paul Sinton-Hewitt CBE was concerned with the “horrendously exploitative … factories in the Far East employing questionable practices, paying the lowest wages and exposing their workers to dangerous conditions”. Paul is right to be concerned about the wellbeing of East Asian factory workers, but moving those jobs to Europe is not the solution. Moving manufacturing jobs from places where jobs are scarce, to Europe where jobs are not scarce, is not a good thing. My point is not a new one; Paul Krugman, the nobel-prize winning left-wing economist wrote more than ten years ago in praise of sweatshops. But the point still stands, and is still apparently missed. The factories in which most of our sports gear are made have poor working conditions compared with jobs in rich countries, but they are usually preferable to the actual alternatives facing people unfortunate enough to be stuck in poor countries. In 1980, before it became the workshop of the world, extreme poverty in China was close to 90 per cent. Today it is less than 1 per cent. That change would not have been possible without the manufacturing industry. It’s hard to think of anything else that has had a bigger positive impact on human wellbeing that the transformation of China’s economy. And it’s not just China that has benefited. Now that wages are starting to rise in China, manufacturers are moving on to other lower-income countries, such as neighbouring Vietnam and Cambodia, but also further afield, to Ethiopia and Nigeria. Researchers Rachel Heath and Mushfiq Mobarak looked at what happened in Bangladesh when garment factories started opening. As factories rewarded basic literacy and numeracy, girls who lived in villages near to new factories chose to stay in school longer. The effect on education was bigger than a government social programme explicitly designed to increase schooling. In Ethiopia, Chris Blattman and Stefan Dercon found that people use factory jobs as a safety net. Pay and conditions may be poor in the new factory jobs, but they are always there, even when other informal means of getting by fall through. So what is a concerned Park Runner to do? Ultimately pay and conditions in poor countries will only improve when workers get better outside options. Thanks to the hard work of poor Chinese in the 1980s and 1990s, China’s economy has grown, wages have risen, and Chinese workers today can afford to ask for more and turn down the worst offers. The best way to encourage that trend is to continue to buy things made in poor countries. Other ways to give poor people more options are to just give them cash directly (you can do literally that at givedirectly.org), to go on holiday to poor countries and spend money on services from poor people, or if you’re a citizen of a rich country to encourage your government to make it easier for people from poor countries to come and work in your country. I have nothing but admiration for Paul Sinton-Hewitt’s founding of Park Run, and of his desire to create an inclusive and ethical line of sportswear. I just hope he reconsiders his decision not to support jobs where they are needed most. How smart are teachers in developing countries? 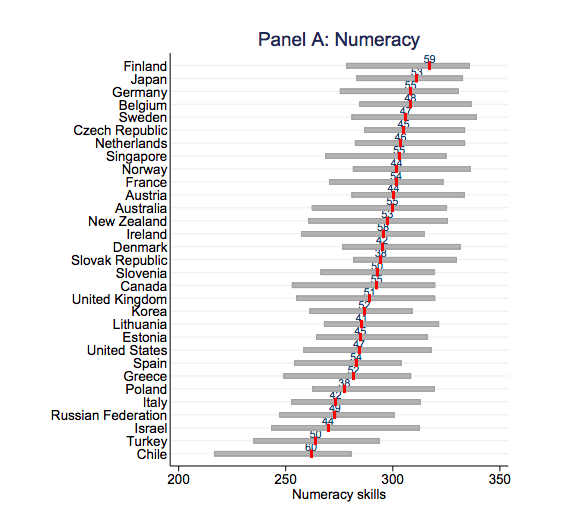 Eric Hanushek, Marc Piopiunik, and Simon Wiederhold published some fascinating analysis in a 2014 NBER working paper (link) comparing the literacy and numeracy of teachers to the overall population (with a university degree) in a range of OECD countries. 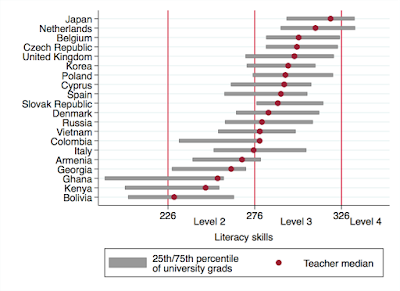 In the figures below, the grey bars show the gap between the 25th and 75th percentile of skill for all university-educated adults in each country, and the red marker in the middle shows the median skill level of teachers in that country. Perhaps unsurprisingly, teachers in Finland are the highest skilled internationally, but also within Finland they are drawn from relatively high in the distribution of adults. This fits with common narratives about teaching being a particularly well-regarded, and selective, profession in Finland. As far as I'm aware, no such comparison exists for low- and lower-middle-income countries. Tessa Bold and coauthors present results on the tragically low absolute level of teachers in sub-Saharan Africa (link), and similarly Justin Sandefur presents data comparing the skill level of teachers in sub-Saharan Africa to students in OECD countries (link). But neither compare the level of skill of teachers in Africa to teachers in high-income countries, and to the skill of other adults in Africa. So I made one*. 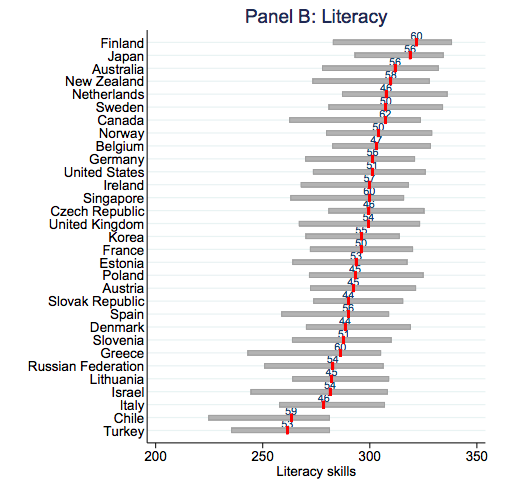 The World Bank's STEP Skills surveys use the same literacy assessment as the OECD PIAAC survey that Hanushek et al used, so I replicated and extended their graph, adding on the countries from the STEP data in which it was possible to identify teachers and their literacy level - specifically Vietnam, Colombia, Armenia, Georgia, Ghana, Kenya, and Bolivia. The first point to note is how low the overall distribution in lower income countries is. The majority of adults (in urban areas) who have graduated from university fall into the Level 2 category, whereas in high income countries most fall into Level 3. 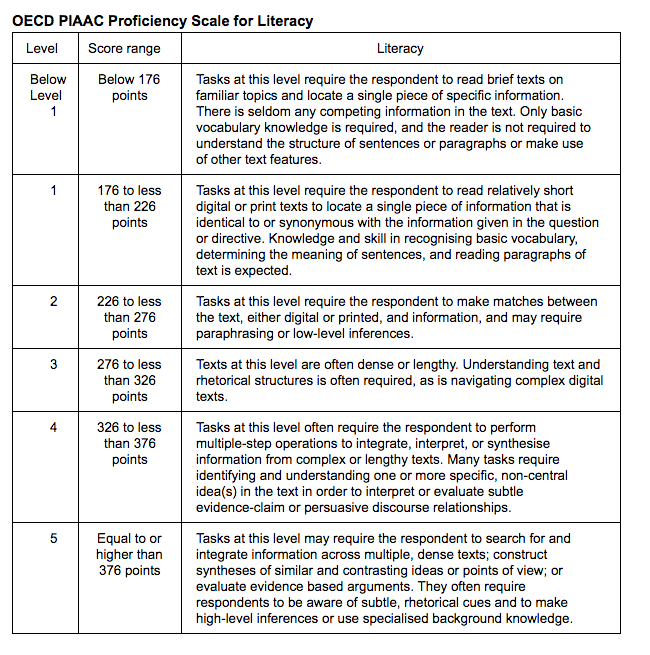 The PIAAC guide (copied below) explains what these levels mean: Level 2 tasks “may require low-level inferences” whereas Level 3 tasks require “navigating complex texts”. The second point to note from the figure is the remarkable regularity of average (median) teacher performance in each national distribution. There is some variation, but most teachers in high-income countries are roughly in the middle of the distribution of university educated adults. Teaching in lower-income countries tends to be more selective - the median teacher is much closer to the 75th percentile of adults in Colombia, Ghana, and Kenya. 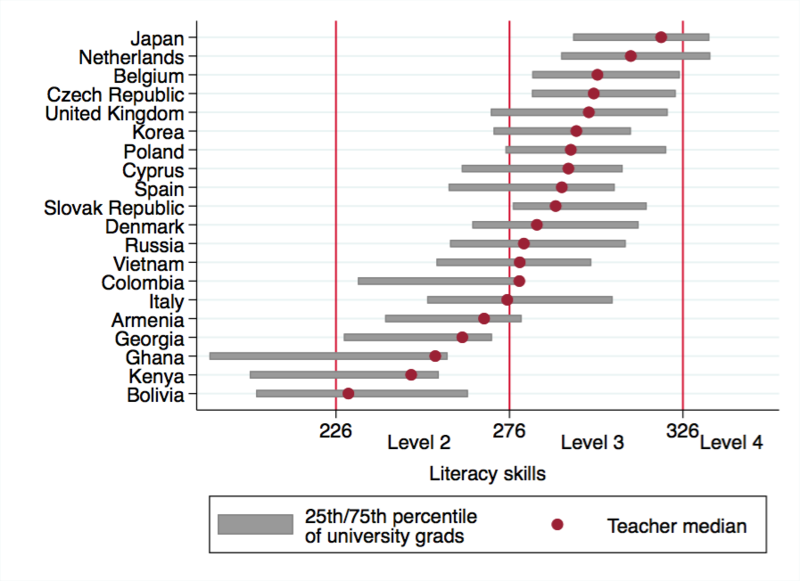 These two facts, the low overall level of literacy skill amongst graduates in the lower middle income countries, and the position of teachers within the distribution, imply an upper bound on the ability of a more selective recruitment process to improve the average quality of teachers. 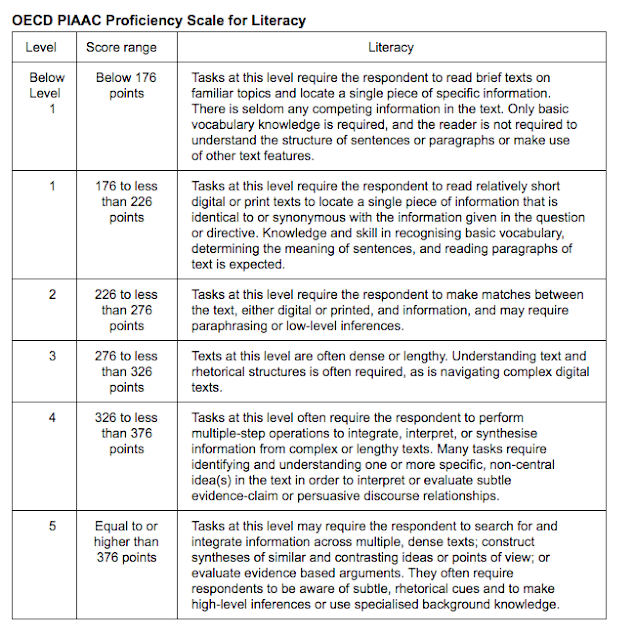 If for example Ghana and Kenya managed to increase the selectivity of the teaching profession enough to raise average teacher skills to above the 75th percentile (something no other country has done), this level could still be well below Level 3 on the PIAAC scale. Getting better teaching is critical for improving education in developing countries. This data highlights the scale of one aspect of the challenge. Education systems are going to have to figure out how to deliver for children with teachers who may be able to make "low-level inferences" but are unable to "navigate complex texts." *Thanks to Laura Moscoviz at the Education Partnerships Group for assistance with the graph! Hi Roving Bandit blog fans! Long time no write. I've just relocated from London to Kigali, so I'm hoping that being in a more stimulating environment is going to encourage me to start blogging more frequently. Probably the best economics blog in Rwanda! I'll kick things off by just regurgitating some recent twitter chat. A couple of days ago I posted Gallup survey findings that Rwanda is the 3rd most accepting countries for migrants in the world (pretty cool Rwanda). The brilliant Dina Pomeranz responded "A friend who works at Afrobarometer told me that survey responses from Rwanda are problematic in general, because people tend to answer "it's very good" to everything (out of fear of repercussions)." This would indeed be worrying were it the case, but I was sceptical. Afrobarometer doesn't actually operate in Rwanda, but I thought I'd take a look at some responses on some of the surveys that have been done here. First, the 2014 National Household Survey asks people about satisfaction with some government services. That seems to be a lot of people who were not afraid to give a negative answer to a survey. The 2015 DHS asks people about their experience of personal violence, and a large number of people do say they have been affected. - 38% net dissatisfaction with hygiene & sanitation services. These do not at all look to me like the kind of numbers you'd expect from people so cowed by fear that they are afraid to give negative responses to an anonymous survey. Maybe its time for the team at Afrobarometer to take another look at Rwanda?